Zurich, Switzerland -- Sepp Blatter and Michel Platini were each banned for eight years by the FIFA ethics committee on Monday in a stunning removal of world soccer's most powerful leaders. FIFA President Blatter and his one-time protege Platini were kicked out of the sport for conflict of interest and disloyalty to FIFA in a $2 million payment deal that is also the subject of a criminal investigation in Switzerland. In a defiant news conference shortly after the verdict was announced, Blatter said he would appeal to the Court of Arbitration for Sport, insisting he had done nothing wrong. His last words on leaving the conference were "I'll be back." Blatter's FIFA career is ending in disgrace after more than 17 years as president and 40 years in total with the scandal-hit governing body. Platini's bid to succeed his former mentor in the Feb. 26 presidential election is now likely over. Platini,, a FIFA vice president and head of European governing body UEFA, is also expected to appeal. Blatter made it clear he regretted his current position but declared he was innocent of any wrongdoing. "I regret, but I am not ashamed," he said. ""I am sorry that I am a punching ball. I am sorry for football... I am now suspended eight years, suspended eight years. Suspended eight years for what?" FIFA's ethics judges decided that Blatter and Platini broke ethics rules on conflicts of interest, breach of loyalty and offering or receiving gifts. Both denied wrongdoing in 2011 when Platini took $2 million of FIFA money approved by Blatter as uncontracted salary for work as a presidential adviser from 1999-2002. In Monday's verdict, Blatter was fined 50,000 Swiss francs ($50,250) and Platini 80,000 Swiss francs ($80,400). "Neither in his written statement nor in his personal hearing was Mr. Blatter able to demonstrate another legal basis for this payment," the judges said. "By failing to place FIFA's interests first and abstain from doing anything which could be contrary to FIFA's interests, Mr. Blatter violated his fiduciary duty to FIFA. Blatter hit back at that conclusion during his news conference, portraying the ethics committee as saying: "He's a liar and I'm a liar." "This is not correct," Blatter said. Responding to a reporter's question, he said in French: "I'm sad. It can't go on this way. It's not possible. After 40 years, it can't happen this way. .. I'm fighting to restore my rights." Blatter, who turns 80 in March, said he wants to preside over the FIFA congress on Feb. 26 where his successor will be elected. The 60-year-old Platini wants to clear his name, pass a FIFA integrity check and be declared an official candidate in the election he had been favored to win. Platini's campaign has stalled since he was questioned on Sept. 25 in a Swiss federal investigation of suspected criminal mismanagement at FIFA. Switzerland's attorney general has opened criminal proceedings against Blatter for the suspected "disloyal payment" of FIFA money to Platini and selling undervalued World Cup TV rights for the Caribbean. Platini's status in the criminal case is "between a witness and an accused person," attorney general Michael Lauber said in October. 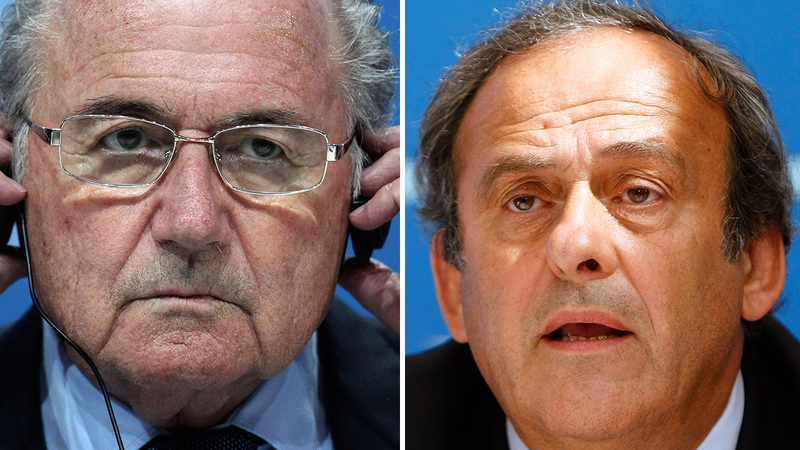 In recent media interviews, both men have said Platini asked Blatter for a salary of 1 million Swiss francs. He got a contract for 300,000 Swiss francs annually, in line with FIFA's then-wage structure, plus a "gentleman's agreement" to get the rest later. Swiss law obliged FIFA only to pay the deferred money within five years. Platini was paid in February 2011, just before Blatter began campaigning for re-election against Mohamed bin Hammam of Qatar. Platini's UEFA urged its members weeks before the June 2011 election to back Blatter, who was elected unopposed when Bin Hammam was implicated in bribery. Few FIFA officials knew of the Platini payment which emerged during a wider Swiss probe of the governing body's business affairs, including suspected money laundering in the 2018 and 2022 World Cup bidding contests. Platini was an icon of French football, a former national team captain and coach, when the newly-elected Blatter offered him a job in 1998. He had led the organization of a successful 1998 World Cup, won by host France, and on the eve of the tournament had campaigned to help Blatter win the FIFA presidency. Blatter appeared to see Platini as a protege in FIFA politics who could add ideas and credibility to his presidential office. Their friendship cooled after Platini was elected UEFA president in 2007. It became strained when Blatter reneged on a 2011 promise to step aside in four years' time, which could have left Platini a clear run at the FIFA top job. Blatter was re-elected for a fifth term in May, beating Prince Ali bin al-Hussein of Jordan two days after American and Swiss investigations of bribery and corruption were unleashed on FIFA. Platini had urged Blatter to resign immediately but was ignored. Just four days later, Blatter announced his resignation plans - provoking the Feb. 26 election - under pressure from the corruption crisis.